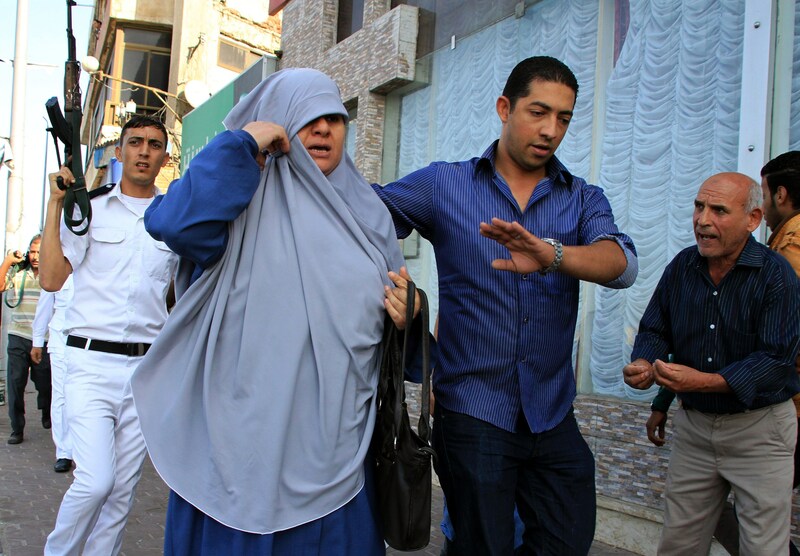 Plain clothes police arrest a woman as Islamists hold a protest in the Mediterranean Egyptian city of Alexandria ahead of the start of the trial of deposed president Mohamed Morsi on November 1, 2013. Three misdemeanour courts in Alexandria sentenced on Tuesday 220 detainees to prison for charges including assembly, “thuggery”, and vandalism. The Sidi Gaber Misdemeanour Court sentenced 134 defendants to three years’ hard labour and an EGP 50,000 fine. They were arrested during the Friday clashes which took place in the coastal city on 30 August 2013. The Raml Misdemeanour Court sentenced 41 defendants to seven years of hard labour and seven years of probation following their release; they were arrested during clashes which took place on 6 October. A third group of 45 defendants were sentenced to three years of hard labour and three years of probation by the Montazah Misdemeanour Court for clashes which took place on 1 November. Mohamed Hafez, one of the lawyers representing the three groups of defendants, said the 220 defendants were also referred to Homeland Security Prosecution, as they are charged with joining the Muslim Brotherhood. Former Prime Minister Hazem El-Beblawi’s cabinet listed the Muslim Brotherhood as a terrorist organisation on 25 December 2013. “Almost 90% of the arrests conducted on background of clashes in Alexandria are random,” Hafez said, doubting that the 220 defendants are all members of the Muslim Brotherhood. He added that many of the 220 defendants were arrested by citizens and not by policemen, which makes their arrest “void”. Hafez criticised the legal procedures during the trial of the 220 defendants. He said that according to the law, if a defendant is both charged with a crime and a felony, both being connected, he should be tried by a criminal rather than a misdemeanour court. “Receiving verdicts from a misdemeanour court then being referred to a criminal court is punishing the defendant for the same act twice,” Hafez said. Hafez said that the judge who ruled on the 41 defendants disregarded Article 32 of the Criminal law. The article stipulates that if several crimes are committed for the same purpose and are so interconnected that they are indivisible, they shall all be considered one crime and a ruling shall be passed inflicting the penalty that is prescribed for the most serious of these crimes. Authorities have led a crackdown on Islamists after former president Mohamed Morsi’s ouster on 3 July, and most Brotherhood leaders have been detained, many facing trials.